=►Soak tamarind in half cup of water and keep it aside. =►Heat 4tsp of oil in a earthern pot ( meen chatti) or pan and put fenugreek seeds. 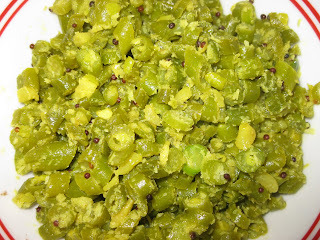 =►When it cracks add sliced ginger, garlic, green chilies and curry leaves into it. =►Next add sliced onion and salt into it. and sliced tomatoes into it. =►Mix it properly unitl the tomatoes gets completely mixed into it. =►Then put ½ cup tamarind juice into it. Allow it to cook for 3-5min. 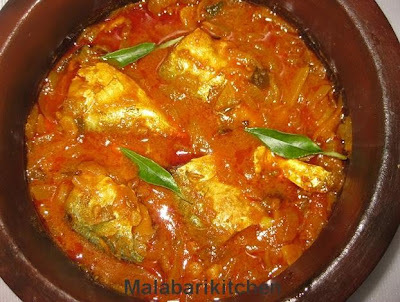 =►When the tamarind boile nicely put cut fish pieces into it. =►If you want more gravy ,add ½ cup of water into it. =►Allow it to cook for 15-20 min on sim flame. =►When it cooks well switch off the flame. 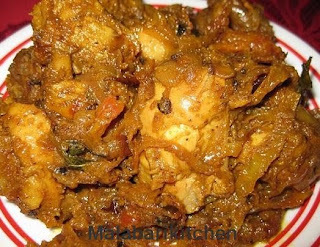 =►Pour 1-2tsp of coconut oil on this curry and garnish with curry leaves. Note - Instead of tamarind we can use kudam puli also.